Writing for young readers, author Laura Scandiffio relates the detailed story about the remarkable burial discovery of King Richard III and what it says about the real king, beyond the popular accounts and tales of infamy. England, August 22, 1485: On a summer morning, two armies approach from opposite directions. Soon they will meet in fields skirted by marsh in the heart of England’s countryside. The larger army pauses where it commands the higher ground, enjoying an advantage over the still-unseen enemy. Its leader is King Richard III. His opponent is Henry Tudor, a challenger for the throne, backed by an army of French mercenaries and Welsh supporters. Richard knows Henry’s troops will come this way as they head toward London, and Richard’s English soldiers will be waiting to intercept them. Before setting out after dawn, the king paraded in armor on horseback before the line of his army, 8,000 strong, their banners fluttering in the breeze. He placed the royal crown on his helmet for all to see. It is a solemn ritual to symbolize his right to rule and to remind them of the loyalty they owe him. Richard knows that if he can defeat Henry today, he will destroy the only real threat to his throne. Henry Tudor’s army appears in the distance. It is much smaller, a little over 2,000 men. Henry is unsure of his chances and remains in the rearguard, the better to escape should things go wrong. The fighting begins, and the odds are in the king’s favor. Then Richard does something as unexpected as it is bold. He gives up his place on the high ground and personally leads a cavalry charge, skirting the enemy army and galloping straight for Henry himself. It is all over quickly. 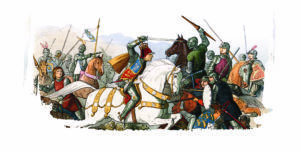 Richard is killed, the last English king to die in combat, at the Battle of Bosworth Field. Henry orders Richard’s body to be stripped and draped over a horse and led to the nearest city, where it will be displayed for all to see and believe—Richard is dead, and Henry is now king. This much was known to be true. But how exactly did Richard die? Where was he buried? Most important, were the terrible stories later told about this controversial king an honest portrayal? Historians puzzled over these mysteries for centuries. It was only with modern technologies—from DNA sequencing to forensic science and medical imaging—that the truth could be uncovered and a true portrait of a notorious king vividly painted. Henry Tudor took the throne as Henry VII, and, little by little, the reputation of the defeated King Richard was destroyed. Chroniclers who had once praised Richard now condemned him. Did they at last feel free, now that he was dead, to tell the truth? Or was there another reason? 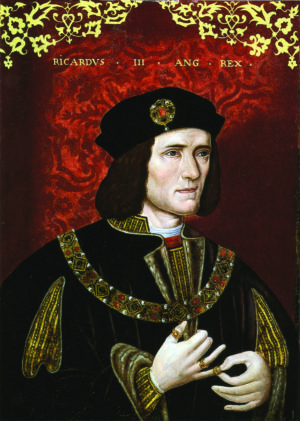 Richard III was born in 1452 and was King of England from 1483 to 1485. He was the younger brother of King Edward IV. When Edward died, the king’s 12-year-old son was crowned Edward V. Richard took on the role of lord protector, running the government for the boy, who was too young to rule on his own. That same year, Richard brought forward evidence that his nephew was in fact illegitimate and therefore could not be king. Richard was crowned instead. Edward and his younger brother were sent to live in the Tower of London, and eventually disappeared. It was long rumored, but never proven, that they were murdered by their uncle, the new king. It has often been said that history is written by the victors. Could this explain what happened in the case of Richard III? Did chroniclers join a smear campaign to win favor with the new regime? If so, it worked extremely well. With each retelling of his story, Richard became more villainous. He was blamed for more murders and crimes—all, apparently, part of his diabolical plan to seize power. The list of his alleged victims eventually included Henry VI; his brother George; his two nephews; his wife, Anne; and various nobles. And what about his physical appearance? He had a crooked back, they said, a limp, and a withered arm. A physical deformity, medieval people thought, was a sign of inner evil—or of God’s punishment. The man was obviously a monster! A century of attacks reached a climax in William Shakespeare’s play King Richard III. His Richard is a hunchbacked schemer without a conscience, who kills for power and delights in his own wickedness. A few people began to ask: Could Richard really have been so bad? Even his worst enemies had praised his courage in battle, and others agreed that as king he had upheld justice. Yet for the next three centuries, the image of Richard-as-villain stuck, and most historians accepted it. The real Richard seemed to be lost in a tangle of exaggerations, myths, and half-truths. Even his grave had disappeared. How Do You Lose a King’s Grave? It is surprising and bizarre—how could the grave of someone as important as a king get lost? Accounts written in the first years after Richard’s death are sketchy, but it seems that for two or three days his corpse was displayed publicly in Leicester, the city nearest the battlefield. This was on Henry’s orders, to prove Richard was dead. Richard was then buried “without any pomp or solemn funeral”—dropped into a hastily dug pit—in the floor of a local church. Two later accounts confirmed this was in the church of the “Greyfriars,” friars who wore gray robes. In the 1500s, during a period of religious upheaval in England, many churches were destroyed, including the Greyfriars priory. A story began to circulate that, in the turmoil, Richard’s remains had been dug up. An angry mob had carried his body through the streets and dumped it into the river. In the 1600s, historian John Speede wrote that Richard’s now-empty gravesite was in ruins, and his stone coffin had been made into a drinking trough for horses. Most historians accepted this account. There was no evidence to refute it. In the centuries that followed, new buildings rose over the ruins of old ones, and the medieval city vanished beneath them. And with it disappeared any certainty about where Richard’s final remains might be. In 2004, English historian John Ashdown-Hill took a closer look at Speede’s account of searching for Richard’s grave and the map he had drawn. He discovered that Speede had made a mistake: he had gone to the site of the Blackfriars priory, not the Greyfriars! Could Richard’s remains still lie somewhere under modern Leicester? At the same time, Ashdown-Hill had been asked to help identify a set of bones buried in a Belgian church. They might be the remains of Richard’s sister Margaret of York. Could he produce a DNA sequence* for Margaret to confirm it was her? To do this, he would need a DNA sample from one of her descendants. First, he would have to trace a family tree, mother to daughter, to a living descendant of Margaret’s. Technology was now available to compare that person’s DNA with the DNA of the skeletal remains and see if they matched (see p. [TC]). Margaret’s family tree died out, so Ashdown-Hill tried again with Richard’s older sister Anne. He scoured baptismal registers, census data, and family letters. To his growing amazement, the line kept going, mother to daughter. Richard’s sixteenth grandniece was living in Canada—Joy Ibsen. When Ashdown-Hill contacted Ibsen with the news, she was stunned. She had no idea she was related to the infamous king. Our cells contain two types of DNA. Nuclear DNA is a fifty-fifty mixture of both parents’ DNA. But mitochondrial DNA (mtDNA) is inherited entirely from the mother unchanged. Richard and his sisters would have had identical mtDNA, inherited from their mother. Yet only his sisters would pass on that mtDNA to their children, and only their daughters could pass it on in turn. Richard had no direct descendants. But Ashdown-Hill realized that just as a mtDNA match with Ibsen could prove that the skeleton in Belgium was Margaret’s, it could also prove the identity of Richard’s remains––if only his lost burial place could be found. Philippa Langley, a writer living in Edinburgh, was visiting Leicester in 2004 to get ideas for a screenplay. She believed history had been unfair to Richard III and that his life would make a dramatic movie. Maybe walking the streets of the city he visited before his final battle would provide inspiration. Langley headed to a parking lot on New Street. A portion of a ruined medieval wall in the modern car park had prompted rumors that the Greyfriars church might have once stood there. She walked past the cars to the stone wall, but nothing seemed helpful to her quest. As she exited, she noticed another parking lot across the street, behind gates and a “Private” sign. Curious, she slipped through and walked across the lot toward a red brick wall at the other end. As she neared the wall she felt the oddest sensation: “My heart was pounding . . . I had goose bumps, so much so that even in the sunshine I felt cold to my bones. And I knew in my innermost being that Richard’s body lay here. Moreover I was certain that I was standing right on top of his grave.” But would anyone believe her? Five years later, Langley invited Ashdown-Hill to Edinburgh to give a talk to the local Richard III Society, a group that shared their keen interest in the king. She told him about her instinct; he explained his research. He believed he knew where the Greyfriars church had been located: it must be at the northern end of the parking lot where she had stood. Langley made a decision. 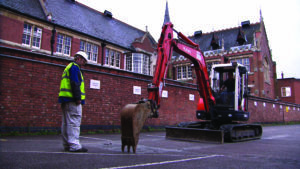 With the help of the Richard III Society, she was going to search for the king’s grave! 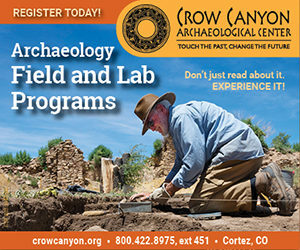 Langley convinced the city council to permit a dig in the parking lot, then met with archaeologist Richard Buckley from the University of Leicester. He was intrigued by the idea of finding the lost Greyfriars church. 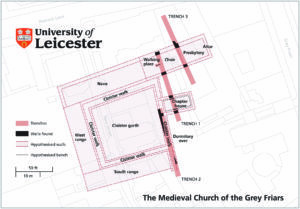 It might reveal new insights about medieval Leicester and life 500 years ago. They struck a bargain: Buckley’s team would search for the church; Langley would keep her fingers crossed that the excavation would also turn up a grave. Buckley guessed the chances of finding the church were about fifty-fifty. The grave of the king, however, was beyond a long shot. “A million to one,” he joked. In August 2012, Buckley’s team prepared to break ground. The excavating machine roared into action. Its driver swung the mechanical arm with its clawlike scoop, which began to chew up the tarmac of the first trench. To everyone’s disappointment, the first bits of stonework they found turned out to be the remains of a Victorian outhouse. Matthew Morris, the site director, suddenly raised his hand in the air, and the roar of the excavator stopped. About 1.5 m (5 feet) down, a long bone was visible in the soil. It looked like a leg bone. Using a trowel, Morris gently removed the earth around it. Slowly, a second bone came into view, lying parallel to the first. It looked like two legs, side by side. Could it be part of a skeleton? Morris reminded Langley not to jump to conclusions. These could be from any century and might belong to anyone. So far they hadn’t found a scrap of medieval stonework that might locate the church. In any case, they could not disturb the bones until they had applied for a license to exhume human remains for archaeological purposes. As the dig progressed, bit by bit, evidence of a medieval building came to light—decorated tile and stained glass. Several days into the dig, the team uncovered unmistakable evidence of church walls and graves. It was enough to convince Buckley to apply for a license to exhume the human remains. Team members prepared to uncover whatever lay alongside the leg bones. They donned forensic suits that covered them from head to foot, to avoid contaminating the bones by shedding their own DNA, and stepped gingerly into the trench. Jo Appleby, an osteologist (an archaeologist specializing in human bones), worked with a mattock, an ax-like tool with a broad blade, to chip her way down and look for any more skeletal remains. It was indeed a human skeleton. The feet were missing—probably cut off when a wall was laid in the 1800s. Other construction had missed the head by millimeters. 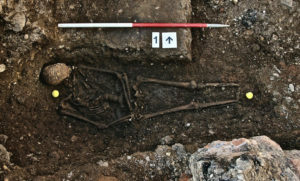 Possibly this was a friar, buried in the church? Appleby next uncovered something startling. The skeleton’s skull was raised and leaning forward toward the chest, and the spine clearly curved to one side, like a C. Langley was shocked. It couldn’t be; she had felt sure that if they found Richard, his spine would be straight, disproving the hostile descriptions. Maybe this wasn’t Richard at all. But if it was . . . did that mean the stories about his physical deformities were really true? The team filmed and photographed the skeleton where it lay. Then each bone was carefully removed and placed in a clear plastic “finds bag.” Altogether they fit in a cardboard box. The archaeologists remained cautiously neutral about the identity of the remains. But Langley and Ashdown-Hill felt differently. They had brought a replica of Richard III’s royal banner, which they draped over the box before Ashdown-Hill carried it to the waiting van. The van headed to the University of Leicester. There, a team of experts would analyze the skeleton from different angles. Their approach would be like fitting together the pieces of a puzzle. The bones were treated like a modern forensic case—what would they reveal about the individual, how he died, and possibly who he was? The first step was to conduct a CT scan of the bones. The scientists could now see inside each bone, without cutting anything open. As part of this process, digital images from the CT scan were used with a 3-D printer to create a model of the skeleton. The model skull was so precisely lifelike that even growth rings could be seen! Meanwhile, the bones were subjected to carbon-14 dating*, to get a rough idea of their age. Two samples from rib bones were sent to different labs to cross-check the results. The outcome was a disappointing setback. It was 95 percent probable that this person had died between 1430 and 1460. But Richard III was killed in 1485. It looked as though the skeleton might be too old to be his. Radiocarbon dating cannot pinpoint an exact date, it can only estimate a range of dates along with a percentage of accuracy. Two results are usually given. The first indicates a 68 percent chance that the correct age lies within a span of years; the accuracy increases to 95 percent when the range of years is doubled. Then new information added a twist. Other isotopes (different versions of the same chemical element) in the bones revealed details about the person’s diet. This man had eaten a lot of seafood. Marine organisms absorb large amounts of carbon-14, so all the seafood he had eaten likely threw off the test. The result was corrected, and now the date of death was 95 percent probable to have been between 1430 and 1530. Further isotope analysis revealed more clues. Isotopes in teeth formed in childhood and the early teens retain signs of water and food grown in different regions, showing where a person lived while growing up. These matched what was known of Richard’s early years—he and his siblings had moved around, often on the run from their family’s enemies. It was also clear that in the last few years, this person’s diet had changed drastically. He’d begun to eat lots of expensive meat, fish, and fowl—a diet of banquets, fit for a king! From the skull, Appleby concluded that this was a man in his late twenties to late thirties (Richard died at 32). A closer look also revealed that he did not have kyphosis, the condition once called “hunchback.” The position of the skull, shoved forward onto the chest, had misled her into thinking the back was hunched, but now it was clear this was just because the body had been dropped into a grave that was too short. The upper spine was, however, curved sideways. Its owner had had another condition: scoliosis. The 3-D model of the spine was studied by Piers Mitchell, a scoliosis expert. Scoliosis would not cause a hunch, but the twisting shape of the spine would make the right shoulder slightly higher than the left. This would not have been visible when the person was dressed, and he would have been capable of regular physical activity. The leg bones were normal, so he would not have walked with a limp. Appleby confirmed that there was no withered arm. Both arms were normal. Whoever he was, he had probably been 1.7 m (5 feet, 8 inches) tall, about average for the Middle Ages. 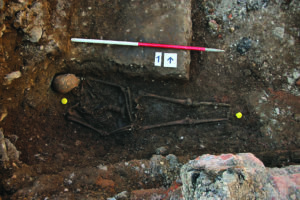 If this was Richard III, the bones proved that the stories about his hunchback, limp, and withered arm were deliberate exaggerations and distortions of the truth. The next challenge was to determine the cause of death. Appleby was joined by a forensic pathologist and a trauma expert who worked on modern murder cases to identify the source of cut marks in human bone. Robert Woosnam-Savage also joined the examination. As curator of armor and weapons at the Royal Armouries Museum, he was familiar with medieval battle injuries and the weapons that inflicted them. Together they looked at each bone for the slashes of sword wounds or the deeper V-shaped stab marks of daggers. There was no doubt this man had died a violent death. The skull bones had damage from multiple attacks using different weapons. Two of these blows could have been fatal and were likely made by a halberd (a weapon with an ax blade and spike on top of a wooden shaft)*. 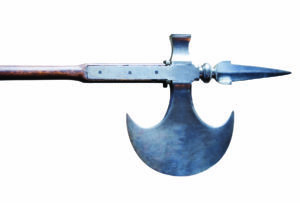 This confirmed one account written shortly after Richard’s death: “One of the Welshmen then came after him, and struck him dead with a halberd.” No battle injuries were found on the body, which must have been well protected by armor. Unusually, the face had been left mostly unharmed. It looked like this victim’s attackers had wanted him to remain recognizable after death. Henry Tudor had indeed displayed Richard’s body so there would be no doubt that the former king was dead. 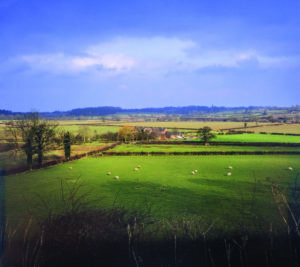 In 2010, the true site of the Battle of Bosworth Field was finally located on the edge of a marsh by archaeologists. Piecing together clues from the battleground with the forensic results from the skeleton, it was at last possible to reconstruct Richard’s final minutes. After Richard’s cavalry charge was warded off by Henry’s soldiers, armed with pikes, Richard’s horse probably lost its footing in the marshy ground, and he was thrown off. Now he was vulnerable in the midst of his enemies, who surrounded him. His helmet was torn away, and his opponents rained blows on his unprotected head. He defended himself vigorously to the end, which came quickly. 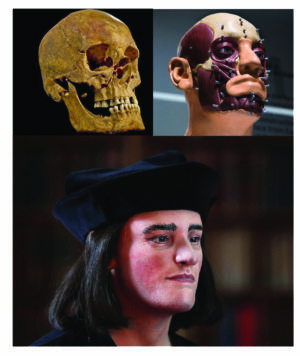 There are several portraits of Richard III, but these are artists’ impressions. Now there was a chance to accurately recreate the face of the king. The science of facial reconstruction, working from a skull outward, has become a proven method of identifying remains in forensic investigations—from murder cases to disaster victims. A skull is as unique as a face, but we cannot recognize it until the overlying muscles and tissues are added. Digital technology has made the process faster and more accurate. Caroline Wilkinson, an anthropologist and professor of craniofacial identification, worked with high-res photos and 3-D CT scans of the skull. As the image of the skull rotated on her monitor, Wilkinson added eyeballs and tissue. Using a haptic arm—a device that translates the movements of her right arm and hand into on-screen changes—she was able to model the skull like a sculptor working with clay. It was time to proceed with a DNA comparison to a living descendant of Richard’s sister. Ibsen’s son Michael lived in London, where he worked as a cabinetmaker, and he had agreed to give a live DNA sample, taken at the parking-lot dig itself. The DNA evidence would be the most essential piece to clinch the identification. Ancient DNA is delicate. Teeth are often the best-preserved parts of a skeleton, and the femur is thick, so samples were taken from each of these. If both samples yielded the same results, it would help to rule out the possibility that the DNA had been contaminated. The DNA sequencing was carried out by two specialist ancient-DNA labs to cross-check the results. Ibsen’s DNA was then compared to the skeleton’s DNA sequence produced by both labs. Both yielded the same result: a perfect match! All the evidence was next subjected to a statistical analysis. The probability that the skeleton belonged to Richard III lay between 99.9994 and 99.9999 percent. 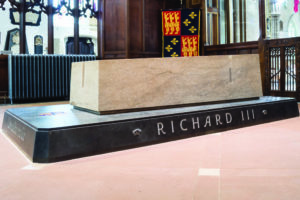 In 2015, King Richard III was reinterred in Leicester Cathedral, in a coffin made by his seventeenth-generation nephew Michael Ibsen. Langley was satisfied that one of her crucial goals had been accomplished: an honorable reburial for Richard in the royal tomb that Henry VII had denied him. Langley’s far-fetched hunch had paid off. The archaeologists pointed out that this was an amazing find, not just because Richard was a king, but because finding a named individual 500 years old, along with the opportunity to analyze the remains, is “extraordinarily rare.” By applying analysis from every relevant stream of knowledge—genetics, medicine, forensics, genealogy, history, and archaeology—the researchers were able to look in incredible detail at the life of a king from the vanished Middle Ages. His life and times—how and where he grew up, what he ate and drank, the wounds that killed him—were all brought to light. So, was Richard a good king whose reign was cut short by treason, or a deposed tyrant? The evidence of the bones helped to strike a balance between the two extremes: by confirming what grains of truth lay in the confusion of accounts, a reputation was restored and a caricature turned back into a recognizable human being. Perhaps the last king of England’s Middle Ages was a man of his stormy times, a capable person in whom ambition and a sense of duty coexisted. The truths about his character and his intentions are still left for historians to puzzle over. The search for King Richard III has taught us that in looking for the truth about a person, science can be applied not just to a skeleton but to history as well. What history has long told us about Richard was held up to the same kind of scientific test as the bones. Legend and fact were separated—the king was not a monster, his body was never thrown in the river, and his coffin was not turned into a horse trough. If these parts of the historical record were untrue, what else might be? The discovery of the lost king is a powerful reminder to view historical “facts” with an open and objective mind. From Digging Deep: How Science Unearths Puzzles from the Past © 2019 Laura Scandiffio, published by Annick Press Ltd. All rights reserved. Reproduced with permission. Digging Deep: How Science Unearths Puzzles From the Past by Laura Scandiffio, shows archaeological discoveries that have made scientific advancements and are now brought to light. From the timeline of the northwest passage to the Kmhere empire, this book is a great STEM resource for those interested in ancient and modern history and those who want to know the science behind such discoveries. More information about purchasing and ordering this book can be obtained at the Annick Press website.